After two years of collaboration, thirty projects undertaken, and a dozen open textbooks released, we are thrilled to announce the publication of The Rebus Guide to Publishing Open Textbooks (So Far). The book-in-progress is the result of innumerable conversations and exchanges within the Rebus Community, and represents a wide range of collective knowledge and experience. Keep telling us in the forum how we can make it easier and more sustainable for you to build books and community—that’s what we are here for! Beyond our pleasure in sharing this outcome, however, we are enormously grateful for the many voices, perspectives, and helping hands that have made the Guide a reality. We also want to highlight those two little words in parentheses in the title: there are plenty of new learnings, knowledge, and reflexive revisions to come! In its current form, The Rebus Guide to Publishing Open Textbooks (So Far) is for anyone thinking about starting or joining an open textbook project. It starts at the beginning of the process, with chapters on project scoping and building a team, and then moves on to content creation and editing, getting feedback and reviews, coordinating release and adoptions, and sustaining the book’s community. Like all Rebus-supported projects, however, the Guide is and will remain an effort that evolves and grows over time. Through conversations, use, new writers’ and editors’ contributions, and ongoing reflection and revision, it will reflect our changing perspectives on how and why we make open textbooks. In this way, it shows where we have collectively gotten so far, while embodying the ethos of openness and the reality that innovation is always characterized by change. As the book is used and the project grows, we look forward to a lively series of discussions on the Rebus Forum, as well as continuing re-imaginings of how our ecosystem makes textbooks. 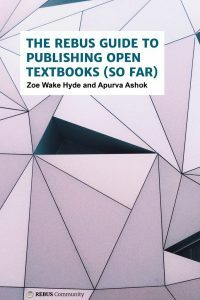 The project and book were initiated by Zoe and Apurva as a way to comprehensively document our approach to OER publishing. Over the last two years, we have worked in a very hands-on way with more than 30 open textbook projects! That means that there are many practices that we have learned to make more inclusive, and numerous insights to exchange with the broader community of OER users and creators. Capturing them in text, but in a way that can evolve, is our aim with the Guide. Of course, because every project is different, there is no single template for success. In fact, it is within those differences that we see so much potential for making the Guide a living and dynamic resource. The Guide represents an important moment in the evolution of the Rebus Community, a culmination of two years of great, collaborative work. Moving forward, it will serve as a living repository of collective knowledge, equipping those who want to publish open textbooks with the resources they need. Just as the forum and Projects platform provide the tools that can make the community more self-sustaining, the Guide will help build long-term capacity. In turn, we can dedicate more time to refining and extending this infrastructure, and enabling more project teams, anywhere in the world, to create and share OER. As we started working on this project, we realized what a learning experience it is to walk the talk of creating collaborative, open textbooks. Using our own tools and resources has helped us identify what aspects of the platform and process work well, what hiccups still exist, and what kind of solutions and improvements we need to work on next. It has also made us all the more grateful when project leads, contributors, reviewers, and readers (and everyone else!) tell us what they think has been successful, as well as what issues remain. We’ll keep working to resolve those issues and avoid new ones. With every new voice giving us fresh and different perspectives, the Rebus Community grows in diversity—in time, that leads to a more accessible and responsive platform. Managing and contributing to open textbook projects takes a lot of time and hard work. While that might seem obvious, what isn’t so straightforward is remembering to look after your own well-being along the way. Be nice to yourself (and each other): get lots of rest, eat well, and ask for help as often as possible! Along the way, all that energy you’re putting into the project needs to be replenished. The publishing process isn’t always linear—in fact, it rarely is—and that’s a good thing! Sometimes slowing down to deal with the curves in the road is exactly how you learn to see things differently. Our insight is that you don’t have to wait to finish one task in order to move on to another, and you can ‘complete’ a given phase even if all the content isn’t there. Keep things moving on a rolling basis, and stay patient when the rolling gets rocky. We continuously learn that paying attention to accessible design, inclusive language, diverse forms of marketing, and equitable editing is critical. There are implications for additional work down the line, both during production and after release. In the long run, however, this attention is part of what makes open textbook publishing truly open, beyond just the openness of licenses and usage. Nothing about OER is a solo endeavour, and it’s not just authors who “create content.” An open textbook is many things at once—collective processes and outcomes, a learning opportunity, a set of connections within a community. Building a strong team for your project is therefore critical, and thoughtfully nurturing those people will enable them to nurture the project in return. It’s all about the ecosystem, and the stronger and more enjoyable that network is, the stronger and more successful the textbook will be! In the coming weeks, we’ll be shining a light on different parts of the content, development process, and insights that have gone into and come out of The Rebus Guide to Publishing Open Textbooks (So Far). We hope you’ll be a part of the project and follow its progress. Already there are plenty of discussions to be joined, templates and checklists to be used, chapter outlines to be reviewed, and updates to new content. Plus, lots of current and future reflections on why we believe so strongly in this model of publishing—including where it can lead. You’ll also soon be seeing three draft cover designs for the book, and we’ll be asking you for feedback on which ones are most appealing (and why). Stay tuned! Like the Rebus Community as a whole, this book is an outcome of the collective generosity of many dedicated and creative people who believe in rebuilding the publishing ecosystem. We are humbled to have been able to work with our project leaders and contributors over these past two years. This is book is for you—for all of us, in fact—and stands as a promise to keep making (and re-making) the tools and resources that allow us all to create open textbooks. We hope you’ll be inspired by what we have collectively made—so far!